John Ashley Cooper makes reference to Boleside in his famous book, ‘The Great Salmon Rivers in Scotland’, first published in 1980. “As to the principal fishings on the Tweed, the best section of the river (with the exception of early spring) is undoubtedly that which lies between Ettrick Mouth and Teviot Mouth. This includes such good beats as Boleside, the Pavilion, Tweedswood, Bemersyde, Dryburgh, Mertoun, Rutherford, Makerstoun, Upper Floors, Lower Floors and Junction”. “This are all first-class fishings both in Autumn and Spring. They comprise some of the loveliest parts of the river; with a splendid variety of pools suitable both for wading and boating”. Tweed is without doubt one of the four great Salmon rivers in Scotland, rising at Tweed Wells, six miles north of Moffat, and running for a length of over 100 miles to its mouth at Berwick-upon-Tweed. 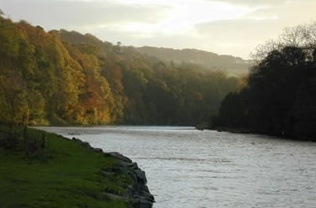 It is generally recognised that the best of the fly fishing is to be found in the middle reaches between Kelso and Galashields: With an annual rod catch of around 9,000 fish a year, Tweed is currently believed to be the most productive rod fishery for North Atlantic Salmon in the World.